Denver, Colorado’s All City Stadium, the home football field for Denver Public High Schools, played host to the 2004 DCI Division II & III World Championships. 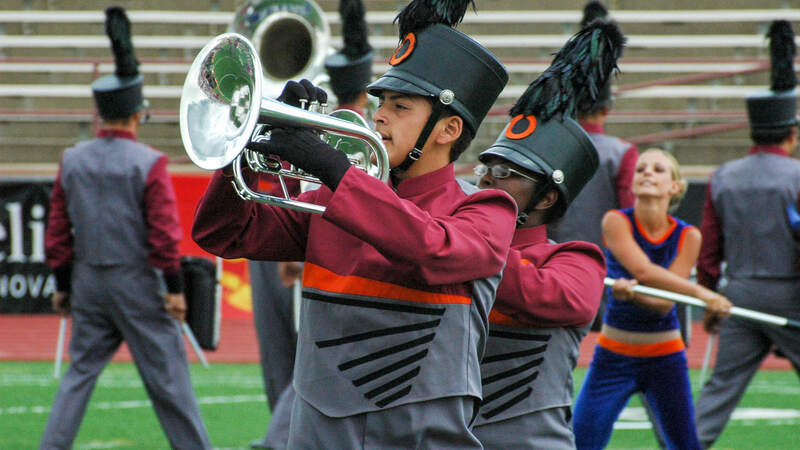 During midday on the final day of the season, the top-12 corps from both divisions—based on overall score from division finals—combined to compete in the Grand Finals competition. At the Division II Finals two days prior, East Coast Jazz finished 1.325 points down to the Spartans. However, as corps gave it their all in the Grand Finals, East Coast Jazz crept within 0.025 points of Spartans’ winning score, largely due to the corps winning the general effect captions. Reversing positions with the third-place Vanguard Cadets from the Division II Finals, Fever, of Modesto, California, finished fourth in the Grand Finals while capturing the top visual ensemble caption score. The name of the second-year corps paid homage to Valley Fever, a Modesto corps that competed between 1980-1986 on the DCI Tour. Fever stayed within California during its inaugural season of 2003, and in 2004 ventured as far as Oklahoma and Kansas before arriving at the World Championships in Denver. The title of Fever’s 2004 production, “Rites of Passage,” held a double meaning. 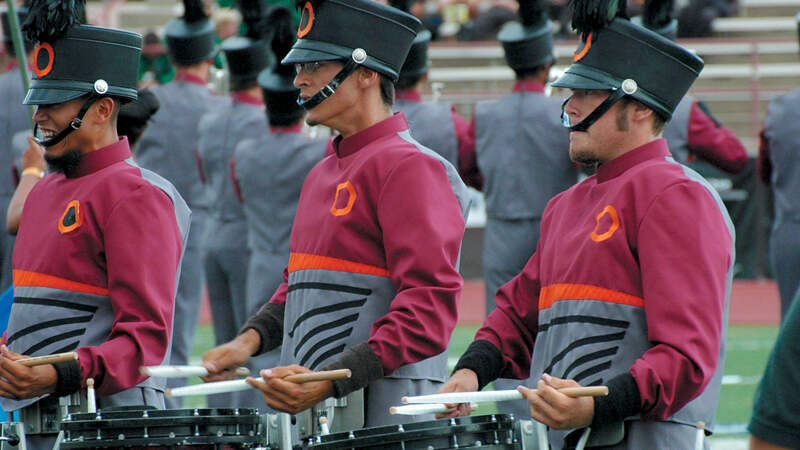 One connotation of the word celebrated the corps taking the big step of attending the DCI World Championships in its second year of existence. The other meaning wistfully recalled the passing of one of the corps’ founders prior to the start of the season. The show started with “Sober” by the rock band, Tool, which is the third track off the group’s 1993 debut album, “Undertow.” The corps’ arrangement of the music seemed to mostly bubble under the surface, then dynamically exploded during the final moments. An extremely brief trumpet interlude of the bassoon solo from the start of Igor Stravinsky’s “Rite of Spring” instantly led into the jazzy “Concerto for Saxophone Quartet and Orchestra, Mvt. 4,” written by modernist Philip Glass in 1995. Melodically angular with jaunty musical lines crashing into one another from opposite directions, the Glass piece made way for Martin Ellerby’s “Paris Sketches,” written in 1994 as a personal tribute to the city beloved by the English composer. The corps played the third movement of the Ellerby work, “Père Lachaise,” named after the French capital’s largest cemetery, which is said to be the most visited in the world. Fever’s color guard members spun flags of various pastel oranges and yellows to suddenly brighten the mood. After playing a show entirely of music by David Holsinger the prior year, Fever went back to the American composer to feature “Providence Unfinished” to end the corps’ 2004 production. Commissioned for the Honor Band of the Indiana Music Educators Association, Holsinger wrote the piece in 2002 as a reaction to the tragic events of September 11, 2001. Color guard flags largely comprised of a muted maroon color picked up the same hue featured as part of the corps’ uniforms, eventually replaced by bright flags of all the colors previously seen in the show. The selection, unforgivingly syncopated with a do-not-go-gentle-into-that-good-night sensibility, ended with an extended series of sharp, stabbing dissonant brass chords, putting an exclamation mark on the corps’ first season outside of its home state.